It was with a heavy heart that I heard last week about the local Borders stores closing, including the one that I’ve shopped at several times over the years since I moved up to the Valley. I’ve done large purchases for the library there, so large that they gave me a book truck to take around the store with me while I shopped. (Between that and my ID badge dangling from my lanyard, more than one person mistook me for an employee. One even followed me around, as if to make sure I really wasn’t just refusing to help her.) I’ve done little personal purchases there. K and I went there at least once while we were newly dating. It was one of the first places I took Lil Miss, all curled up in a borrowed baby sling. It’s where I took Lil Miss to pick out a book for herself last year, after we realized she had actually started reading. And it’s where I took Lil Miss (who has recently given up her afternoon nap) yesterday so K could have the house to herself and grade in peace. Lil Miss picked out a Mo Willems book and a Peanuts bookmark for herself, and I nabbed a Toy Story 3 Sticker Book for her that looked really neat in the store, but turned out to be rather disappointing (for pretty much the reason in the reviews over there – the stickers don’t stick) and a United States map floor puzzle that K is excited to do with her once this round of grading is done. And, of course, I perused the knitting section, which was nearly empty. 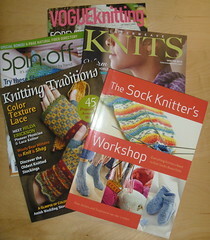 Even most of the knitting magazines were gone. I think that issue of Vogue Knitting might have been the last one in the store. As best I could tell, the cross stitch magazines were long gone. It was one of those moments, really, that I wished Alison Bechdel was still doing a semi-monthly comic. I’d love to hear Mo and Jezanna on the fate of the local “Bounders” bookstore.